For this SketchCrawl we are planning a special fundraiser for the organization Emergency. The date is set to May 19th 2007 and things are starting to really take shape for it. But we need your help to make this a truly amazing event. Here's a couple of important things you can do to help. We have Press Releases for download here (a one pager and a slightly longer one) and we are trying to send them all over the world; to reach all the media outlets, all the artists and all the sponsors we possibly can. If you can please take five minutes of your time to either post this on your blog, or send/email these press releases to local newspapers, art stores, websites, friends, to anyone who might be interested in participating in, covering and/or helping in any way this SketchCrawl, we can then hope to reach every corner of the world with this! We've already received a small donation that is gonna enable us to produce a special SketchCrawl t-shirt, the proceeds of which will go to Emergency. We also just recently started talking to a few local and international Art Supply stores and a few contacts are starting to show promise. I'll keep you posted on all that. Any suggestion or ideas on this front will be very welcome (email me or post a comment here on the blog). -An art auction. We are gonna try and organize an auction here in San Francisco and we're also considering an online auction (please email me if you have expertise in this field, we really can use the help with setting up an Ebay charity auction). All this is gonna give artists around the world an added way of participating to the fundraiser: donating a piece of their art to the auction. -A SketchCrawl book. 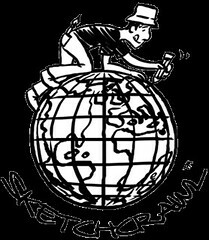 We are gonna be producing a World Wide SketchCrawl book with the wonderful folks at Gingko Press. What does that mean? 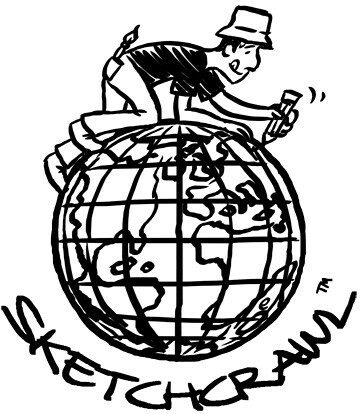 It means that we'll be asking all of you, wherever you are to submit your best sketches and photos from the SketchCrawl to be included in the book! Naturally part of the proceeds will go to the benefit as well. More details on the book will follow. One last thing, to clarify how we see the actual Sketching part of the fundraiser working. We are asking all you sketchers out there to find some sponsors: email your friends, uncles, co-workers, co-worker's uncles and ask them if they are willing to sponsor your drawing marathon! What does that mean? It means that for every drawing that you do on that day they can pledge a certain amount of money. They could pledge any amount per sketch, from one dollar to twenty, whatever they can. They can also just give you a straight out donation. We'll design a pledging form in a few days that is gonna help you keep track of your sponsors. Each one of us, through each one of our drawings, will be raising important funds for this peaceful and worthy organization that is helping innocent victims of war in several conflict-thorn countries. Thank you and please chime with thoughts, ideas, brainstorms, suggestions or such.